When you open a new Huntington Community Business Checking account by April 15, 2019 and deposit at least $2,000, and make 10 transactions, within the first 60 days. 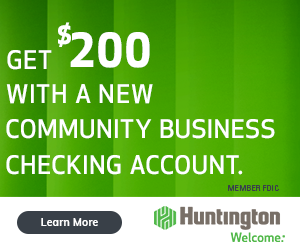 Huntington will deposit $200 into your account after it’s been open for 90 days! To receive your coupon, click “Get Coupon” below. You’ll be directed to the offer page where you can enter your email to receive the coupon offer – from there, visit your nearest Huntington Branch (Locator) to apply! Editor’s Note: Interested in other Huntington related offers? See our review & list of Huntington Bank Coupons! 1 Where Is Huntington Bank Located? Where Is Huntington Bank Located? Huntington Community Business Checking: If you are eligible for this bonus offer, click “Get Coupon” below to be redirected to the offer page where you can submit your email to receive your coupon offer! Once you receive your coupon offer, visit your nearest branch to apply! For more of what Huntington has to offer, see our full list Huntington Bank Deals. To qualify for the $200 cash bonus, you are required to open a new Huntington Community Business Checking account and deposit at least $2,000, and make 10 transactions, within the first 60 days. Huntington will deposit $200 into your account after it’s been open for 90 days! A transaction includes any combination of checks paid, deposit tickets, deposited checks (except those you process through a remote deposit scanner), incoming ACH debits and credits, debit card purchases, and bill payment transactions made through Huntington’s Online Bill Pay service. Account must maintain an open account status for at least 90 days before it is eligible for the bonus payment. Your $200 bonus will be deposited into your new business checking account within 14 days of meeting all of the above requirements. Your business checking account must remain in an open status to receive the bonus. An Early Account Closing Fee will apply to accounts closed within 180 days of opening. 1The average collected monthly balance you keep in your checking account which helps determine which account may be the right fit for your business. 2Earns interest on the money in your account. 3The fee for not meeting your minimum average collected monthly balance requirements. 4The minimum relationship balance that allows the monthly account service fee to be waived. 5The number of transactions included with the monthly account service fee. 6The total amount of cash and coin deposits that can be made at a branch or ATM that are included in the monthly account service fee. Enjoy up to 150 monthly transactions and then $0.50 per transaction over 600. No monthly maintenance fee applies to this account. Do business without a minimum checking account balance fee or maintenance fee. Overdraft Protection Account with no annual fee (credit application and approval required), or Deposit-to-Deposit Overdraft Protection with no transfer fee. Their free, automated email Account Alerts can provide daily updates on your money. Learn More. Includes up to $5,000 in coin/currency deposits each month. A fee of $0.20 for each $100 deposited over $5,000 will apply. Withdraw cash, deposit checks and cash, or transfer money between accounts for free, with Huntington ATMs. Find a local ATM Stop managing paper statements and keep information out of your mailbox with Online Statements and our Huntington online banking. even though you don’t have enough money. your account and we return an item. for accounts located in Florida. there will be a fee each month. rates may affect posted amount. necessary to directly present the item to the originating institution. Keep your money within reach – Manage money easily and securely from nearly anywhere. With Online Banking, all you need is a connected device and you can pay bills, view accounts and more. That’s banking convenience at your fingertips. Start moving your money the simple way. Instantly transfer funds between your accounts and even between accounts at other banks. Set up recurring or one-time transfers to manage your money, your way. Bank from your browser, safely and easily. Check your balances, pay bills, deposit checks and more anywhere you have a connected device. Protect your information and the environment. Go paperless to reduce identity theft risk, and get secure access to statements for the last 24 months. Stay in touch with your money – Move money and more by barely moving a finger. Mobile Banking lets you securely manage finances from nearly anywhere with a few taps on a phone or tablet. Our Mobile Banking app, alerts, texts and more give you the freedom to keep your money close by. Check balances, pay bills, deposit checks and more with their mobile banking app. Made specifically for phones and tablets, their apps let you securely handle your money from nearly anywhere. Learn More Know what’s happening with your account. Sign up for Alerts on the Alerts tab in Online Banking to get email and text updates about your checking, savings, money market or Voice Credit Card™ accounts. (Carrier, message, and data rates may apply.) See Types of Alerts – Learn More Make your next in-store purchase with a single touch using Apple Pay on your iPhone 6, 6 Plus, or Apple Watch. Take this text commands cheat sheet on the go and you’ll never be without the codes you need. Text 446622 with any of the commands to start using Huntington Text Banking. Every day, business owners are faced with decisions that affect profitability, strategy, employees and other areas. Their calculators and educators can help you improve those areas and, most importantly, your bottom line. Build your knowledge related to starting a small business with our online education program. Their interactive learning modules will provide you the tips and information you need to grow as an entrepreneur. Business Banking Services: Learn about key financial products and services that can help grow your business. Get Started. The Huntington Debit MasterCard BusinessCard meets the needs of small business owners who are looking for a widely accepted payment method for their business purchasing and banking needs. Businesses with multiple employees can obtain individual cards for authorized personnel with full or limited functionality, making the card even more useful. Provides coverage for most items you purchase with your eligible MasterCard card if the item is damaged or stolen within 90 days of the date of purchase. Arranges emergency roadside assistance if you get stuck on the road. Service fees are pre-negotiated and billed to your eligible MasterCard card. Provides pre-trip destination information such as visa/passport requirements, immunization, and help with lost/stolen travel documents and luggage. MasterCard has the experience to expedite your claims for prompt and maximized payment. Cash from foreign VAT refunds reduces on-going international business travel costs by 10-15%. Provides personalized assistance for securing dinner reservations, tickets to events, coordinating business arrangements, locating hard-to-find items or booking travel. Pays for covered damages (physical damage and theft) to a rental vehicle when your eligible MasterCard card is used to initiate and pay for the entire rental transaction. Assists you with credit bureau notification and credit card replacement, and provides you with an ID Theft Affidavit should you become the victim of Identity Theft. Community Business Checking Account: No monthly maintenance fee applies to this account. You can download the Huntington Bank Mobile App via iOS or Android! Huntington Bank Mobile App take the great features from Online Banking and build them into an easy-to-use tool. And since they’re designed especially for your phone or iPad®, they’re easy to read and navigate, too. You can download the app via iOS here. Whether you want to check your balance while shopping, pay a bill while waiting in line at the movie theater, make a check deposit or just want to locate an ATM in a new town, now staying in control of your finances is just a few simple taps away. You can download the app via Android here. Call 800-480-2001 (Weekdays 7:30 a.m. to 6:30 p.m. ET and Saturday 8:00 a.m. to 5:00 p.m. ET). Definitely consider the Huntington Community Business Checking if you’re business is new, in the early stage, or have an average monthly balance of up to $5,000 or have 150 or fewer monthly transactions. Let us know about your experience with this account and the bank overall in the comment section below! Be sure to check back on BankDealGuy for more bank deals or anything Huntington Bank related here!